Once a year, my husband and I used to head to Woodbury Common, a nice outlet mall off the NY Thruway. I remember laughing in bewilderment at the Asian or European tourists who would be bussed in by the dozens to the outlet center and would schlep out with bags and bags of who knows what like they were giving it away. Well, after only a year of living in Asia (Middle Eastern Asia, that is) I have become the Asian tourist. And I can tell you, they don’t have anything like Woodbuy Common in Israel. And the discounted jeans or handbags or Jockey underwear they sell in any outlet mall is indeed like giving it away to those of us who are used to buying such things in Israel. Yes, Israel has its fragrant, bustling shuks, and of course, higher end chic goods, as well. But suburbia — with its malls and its Target and its Trader Joe’s — well, that doesn’t really exist in Israel. And the version that comes close (let’s say Kfar Saba, for example) comes at three times the price. I don’t miss American suburbia too much when I am in Israel, but when I am back in the States, watch out. I become as delusional as a self-indulgent reality show housewife…without the bank account to back up my delusions. For various reasons, none of them good, I’ve had to return to the States a few times since making Aliyah. This is my third trip back. I’m in Chicago right now preparing for a whirlwind business trip. Tomorrow, my colleagues will join me in Chicago, Day One of a six day “road show,” during which I will be accompanying 13 technology start-ups across the U.S. to present their companies to potential investors. But today, I am on my own for a few hours on Magnificent Mile. Despite the saggy jetlagged eyelids and the airplane smell that’s still stuck to my cardigan sweater, I feel pretty sophisticated when I say “whirlwind business trip” and “potential investors.” And, quite frankly, if you saw me right now sitting at the desk of my Comfort Suites hotel room, you’d say I could almost pass for sophisticated. 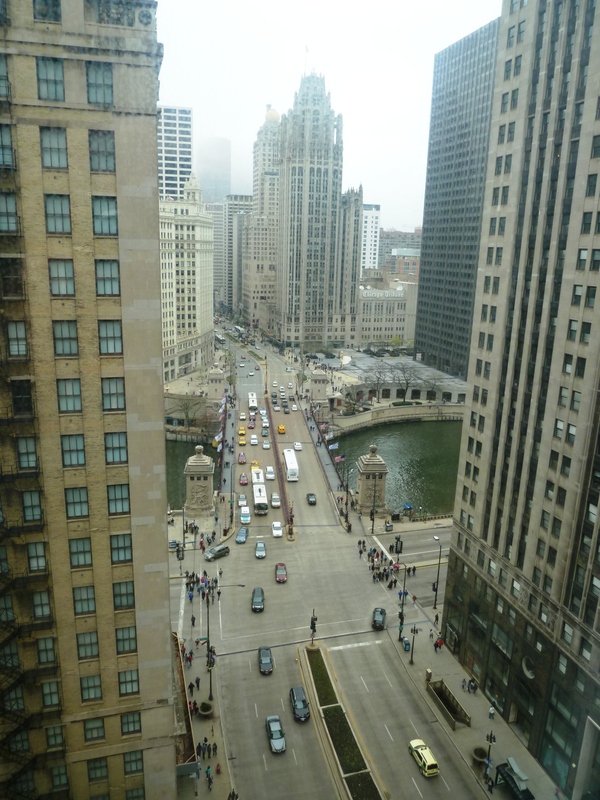 Particularly when you consider the view outside my Michigan Avenue hotel window. But if you had seen me at Trader Joe’s earlier today, salivating over the “Avocados Number” Guacamole, or trying on hundreds of headbands and rings at Charming Charlie’s (where the Accessory Place meets Jelly Belly ) or at Walgreen’s snapping up the Gas-X on sale, you might have thought otherwise. It’s hard to pinpoint who I reminded myself of…a cross between Madison, the mermaid from Splash, and Julia Roberts in Pretty Woman (before she had class), with a little bit of midget thrown in to account for the difference in height. Before you get too disgusted with my materialism, I must tell you I’ve realized there’s a thoughtful side to this madness, too. The side that appreciates what I have…and what I don’t. The side that sees the life I used to live as a treat reserved now for special occasions. And the side that sees how suffering the absence of all the things that I thought made my life easy –like fruit-flavored chewy kids’ vitamins — makes me appreciate those things more than ever before. When was the last time you walked slowly through Trader Joe’s, lovingly gazing at the frozen packaged gluten free waffles? When was the last time you walked into a Starbucks and closed your eyes as the Caramel Macchiato scented air filled your nostrils? When was the last time you felt exuberant at the discovery of “Angry Birds” Band-Aids, knowing that when you brought them home to your kids, they’d practically pee their pants with joy? I held my Starbucks coffee today like it was a prize I had won. I ate my good old-fashioned American chocolate chip cookie like it was a delicacy reserved for royalty. I spent the little money I have for spending with reserve and care, knowing that I only have one suitcase, and four people back in Israel who are excited for the treasure they’ll be handed upon my return. I can see treasure inside a teddy bear shaped bottle of vitamins fromTrader Joe’s. It’s a little disgusting, I know. But sweet, too. Don’t you think? Oh I know exactly what you mean by “treasure” and yes it is oh so sweet! My mom brought over a box of wheat thins and we have been savouring them for three weeks. My youngest asks for two, thinking that is such a treat! There are just certain things that I miss, or things that I totally forgot about that strike a chord in me, but on the other hand, there are so many things in Australia that I know I will miss once we leave. Bittersweet I think.